Over the past twenty years, there has been a fundamental shift in the institutional organization of historic preservation education. Historic preservation is the most recent arrival in the collection of built environment disciplines and therefore lacks the pedagogical depth and breadth found in allied endeavors such as architecture and planning. As the first degree programs in preservation only date to the 1970s and the first doctoral programs to the 1990s, new faculty are confronted with pedagogical challenges that are unique to this relatively nascent field. Based on a conference that included educators from around the world, Barry L. Stiefel and Jeremy C. Wells now present a collection that seeks to address fundamental issues of preservation pedagogy, outcome-based education and assessment, and global issues of authenticity and significance in historic preservation. The editors argue that the subject of the analysis has shifted from, "What is the best way to fix a historic building?" to, "What are the best ways for teaching people how to preserve historic properties (and why) according to the various standards that have been established?" This important reconsideration of the state of the field in historic preservation education will appeal to a broad audience across numerous disciplines. 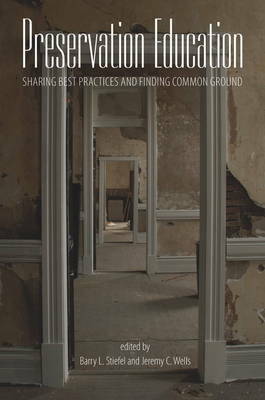 "These essays present the latest thinking on many of today's key issues in historic preservation and are essential reading for anyone interested in the question posed by the editors, of "what are the best ways for teaching people how to preserve historic properties, and why." With its wide-ranging inclusiveness, the editors have set the bar high and have given us much to ponder as we seek to answer this important question for ourselves." -- "Preservation Education & Research"
"Stiefel and Wells' 2014 publication is a must read for all academics and practitioners involved in the delivery of preservation education/heritage conservation at further or higher education institutions, and it should result in a pause for reflection of their content and pedagogy." -- "The Historic Environment"
"The volume contributes to the literature of historic preservation and heritage studies, as well as related to pedagogical practice and theory. It will serve as a source book for instructors and, importantly, practitioners in the field." -- "International Journal of Heritage Studies"